The Sound Division Group has recently supplied and installed a comprehensive sound and lighting system to the American Community School in Egham, Surrey based on a Crown-driven Nexo audio system complete with Martin projectors and a Selecon lighting rig. 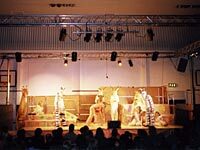 The school, which educates over 550 students between the ages of 3-18 who come from all over the world took the decision to move drama production into the main sports hall and invest in a proper theatre-style sound and lighting system. Once the decision was made and the specification agreed, the whole installation was turned around in just two weeks. Sound Division supplied and installed a total of four Nexo PS-15 loudspeakers which were flown from the lighting truss, and two PS-10 stage monitors plus the requisite TD controllers. 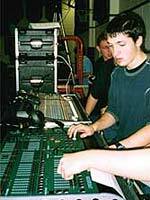 The system was driven by a Crown MA3600VZ and a Crown MT2400 power amplifier. In addition to this Sound Division also supplied and installed a Mackie 32:4 mixing console and a variety of outboard equipment plus a full lighting rig based on a selection of Selecon fresnelles and zoomspots plus two followspots with Zero 88 Fat Frog control, complete with Martin Pro 518 Roboscan projectors. The entire rig is supported by a Doughty wind-up truss system. "It was a pleasure to work on a job like this where the main priority was to do the job properly and not to cut corners," said Sound Division's David Graham. "The client was after a quality system, hence we specified Nexo and Crown which not only sound great but you know are going to be reliable. In fact, Fuzion helped us out tremendously on this one they really pulled out all the stops to get us the gear on time, because it was an incredibly quick turnaround. We had just two weeks from the official confirmation of the job to final commissioning of the system. We ended up with just minutes to spare before the curtain went up on their production, but it was a huge success. The client is delighted." Head of Performing Arts for the school, Ed Woodd agreed. "The level of technical support provided by Sound Division was extraordinary. Their staff worked long hours setting up the kit and patiently training our students to run it, and the difference it made to our recent production was amazing. The lights and sound reached heights never before possible at our school. I wouldn't hesitate to recommend Sound Division to other educational facilities considering going this route."